Normally, the sound of human voices in any public place is like aural wallpaper, but sometimes a snippet of conversation is so ridiculous, so peculiar or hilarious, it breaks through the din. "Overheard in Minneapolis" is an online repository for the most memorable nuggets of local dialogue. Now, the website has become the launching pad for an improv theater troupe's latest production. It's lunchtime and the sidewalk cafe crowd on Nicollet Avenue in downtown Minneapolis is in a chatty mood. Conversation you normally tune out comes at you from every direction when you actually listen. Some of the chatter is fleeting, or in this case swallowed up by some well-heeled footwear. Some of it is in a foreign tongue, and sometimes it's just infantile. But it's all potential treasure to Ang Dezelske, who started overheardinminneapolis.com nearly four years ago. "There's just something interesting to me about what people will say out in public," she said. "Turning their personal filter off or their voice is too loud and they don't care or they don't realize." Dezelske got the idea from another site she found endlessly entertaining, "Overheard in New York." Twin Citians overhear something, send it in to Dezelske and if it's relatively self-contained and funny, she'll post it. She's become something of an expert on Minnesota conversational culture and where to catch it. "Definitely any bar," Dezelske said. "Definitely buses. And definitely the Mall of America." Which could be because of all the out-of-state tourists who shop there. As talkers, Delzelske says Minnesotans live up to their reputation for niceness, at least compared to New Yorkers. They tend to be less vulgar, less profane and more conscientious. What's also interesting is how the juiciest content rises and falls with the seasons. "In winter, I think people stop leaving the house, and so they stop hearing more things," she said. "In the summer, everyone's getting out, and they're away from their computer and, you know, they're not even thinking about it." But in spring, the drama of our Minnesota lives tends to play out more in everyday exchanges, maybe because we've spent the entire winter thinking about what we want to say. That's why Dezelske is thrilled that Huge Improv Theater in Minneapolis is bringing what's been 'overheard' to the stage. Huge Theater executive director Butch Roy says stolen bits of dialogue and improv are in the same family. "It seems so similar to improv in that you're just taking what comes out of people and taking it out of context," he said. "And it seems so absurd, and yet it's so real." The structure of "Overheard in Minneapolis" the show is three narratives seen three times. In other words three sets of performers riff on three different fragments of conversation taken directly from the website that week. "The cast has no idea what dialogue is coming until it's projected on the back wall of the theater and they see it at the exact same time the audience does," Roy said. Huge Theater performers Tim Hellendrung and James Moore came to Minnesota Public Radio to give a demonstration. Their line was "Dude, I've been looking for my didgeridoo and can't find it," overheard at St. Paul's Hidden Falls Park and posted on the website on April 12. "Dude, I've been looking for my didgeridoo and I can't find it." "Okay. I can't help you. I'm just waiting for the bus. I don't know what a didgeridoo is and..."
"You ever been to Deadwood before?" "No. I'm just waiting for the bus. I'm just gonna put my iPod back in, if that's okay..."
"I'm a Civil Way re-enactor, and I need my didgeridoo." And what begins as overheard small talk, says Butch Roy, becomes an intertwined piece of unscripted theater that can go on for quite a while. "It's such a compelling beginning," Roy said. "And I guess that's what makes the site so funny too is you can't help but wonder what in the world caused that series of nouns and verbs to come together. And the fun thing is we get to play with that. We get to see it." 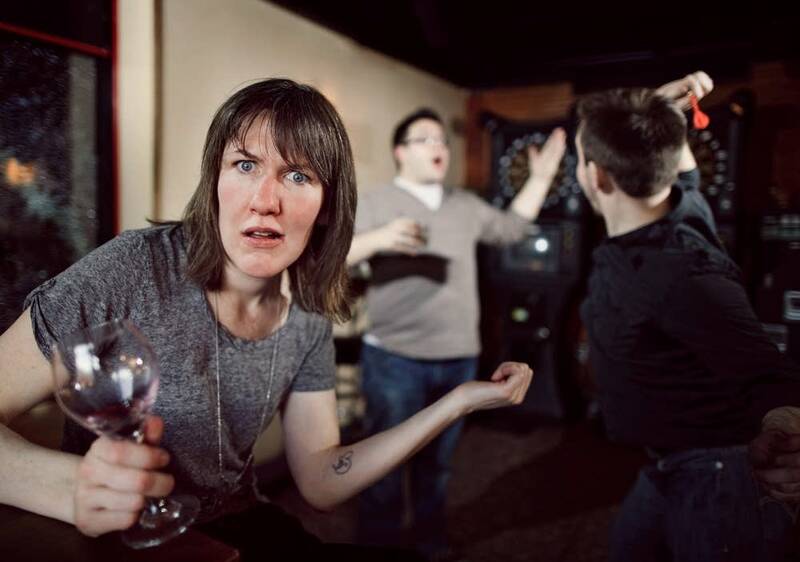 Huge Improv Theater's "Overheard in Minneapolis' happens Thursday nights through May 13 at Intermedia Arts. Butch Roy says he'll know the production has struck a chord if one of the lines from the show, made up on the spot of course, somehow gets posted on the website. Huge Improv Theater's web site.